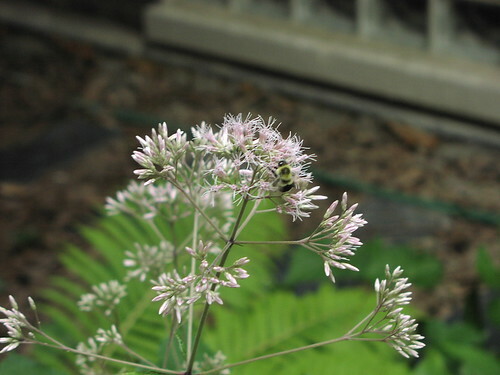 The white buds became pale pinkish purple flowers and immediately attracted bees. I read a post by Gloria. Mystery solved! 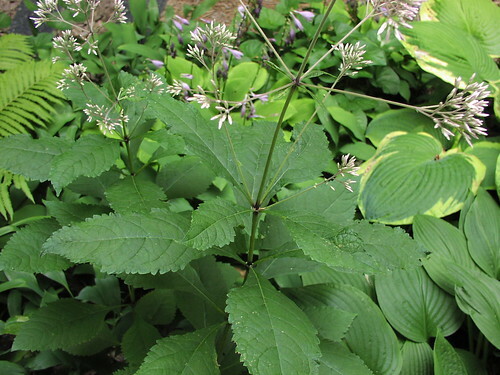 This was the sweet Joe Pye weed (Eupatorium purpureum) that I planted 2 or 3 years ago and gave up on after seeing it struggle to only a foot high with no blossoms that first year. This year, it’s 4.5 feet tall and just starting to bust out in flowers. 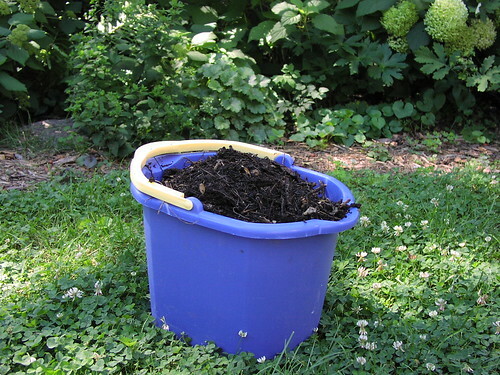 Yet again, writing this blog has reminded me that I do not have enough patience with the garden. A lot of these native perennials just don’t look that spectacular the year they are planted, or even the next year after that (in fact, they sometimes look worse in the second year!). By the third year, though, they’re ready to shine. Oh, and this bed is under a magnolia tree in the 12-foot-wide sideyard, so sweet Joe Pye weed is definitely a good pick for shade! 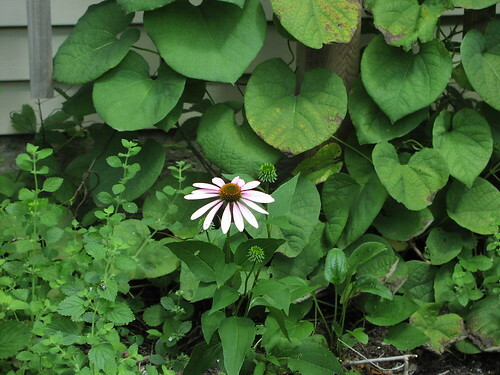 (Notice the tell-tale hostas and ferns in the picture above.) Now I’m hoping it reseeds that bed a bit…so I can wait 4 years for another nice patch to appear. 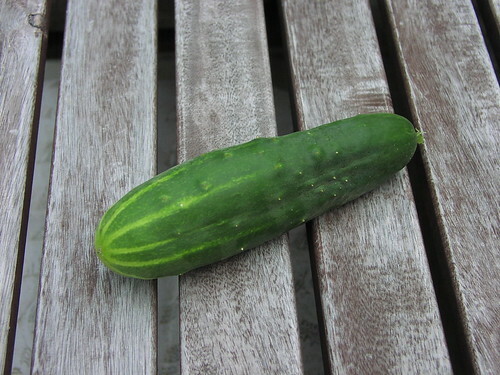 After complaining about my cucumbers earlier, I have now harvested two, with three more just waiting to go. They’re sweet and crunchy – yum! 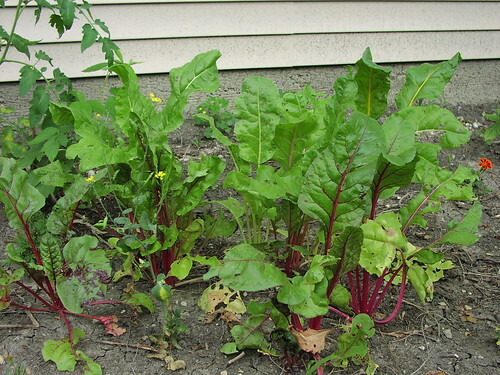 I was surprised to see how well the Swiss chard has survived the summer. You can see some bolting kale in there (along with a volunteer tomato plant), but the chard has not bolted at all. In fact, it’s been growing better as we get deeper into the summer. This probably indicates that it wouldn’t be a total waste of time to plant the chard seeds left over from the spring planting. Time for another round of Rick Bayless’ chard tacos…. 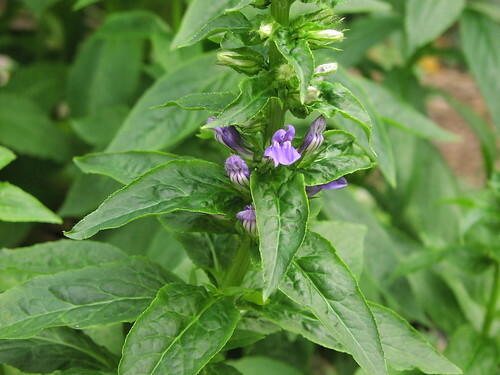 The great blue lobelia (Lobelia siphilitica) by the pond is starting to bloom. Purple seems to be the blooming theme of my mid-July garden. The lobelia is starting to bloom, albeit a few days after people visited my garden on the pond tour. The oregano is putting on quite a show as well. 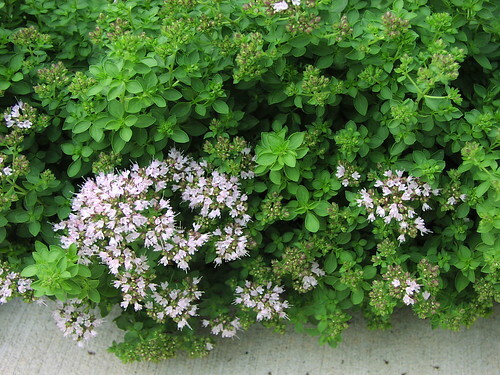 I also have taller oregano with white flowers, but this one is the champion spreader in the garden. 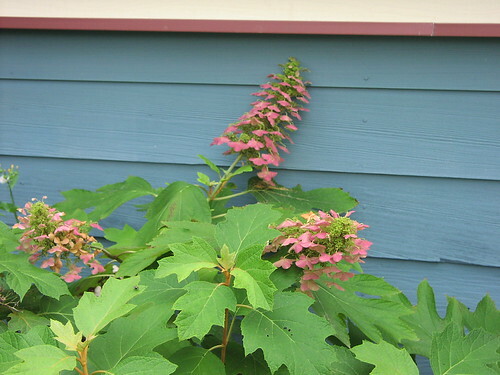 The oakleaf hydrangea flowers have changed from white to pinkish purple. The Annabelles are turning from white to green, which always seemed a bit backward to me! The pond tour on Sunday was fun – about 50 people came to see our pond and chat. It was strange and wonderful to have the enforced leisure of sitting in the backyard for 8 straight hours. Even though I try not to have an overpacked life, I just don’t ever sit outside in one spot for an entire day. Perhaps I should do it more often! I must admit that I’m writing this the night before since tomorrow is pond tour day! Unfortunately, the water lily seems to be taking a break from blooming, and there’s nothing yet from the American bittersweet. Just like my dreams of another White Sox World Series, I think I’ll be waiting for next year! 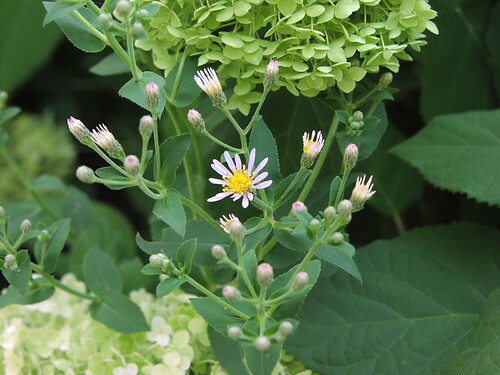 A lot of my posts have been about the pond and all the ornamental plants I’m growing. Now that the vegetable plants are starting to produce, it’s time to switch gears and let them shine a bit. I picked up the tomatillo plants at a garden center in Berwyn. 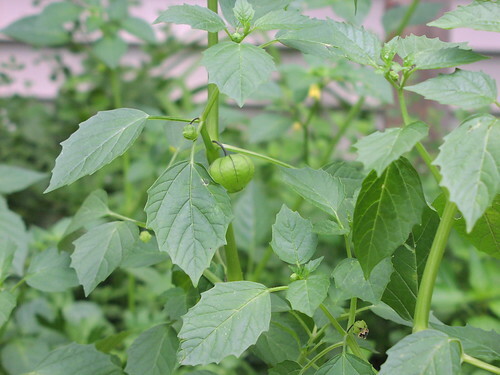 I’ve never tried growing them before; heck, I’ve never seen a tomatillo plant before I walked into the garden center. 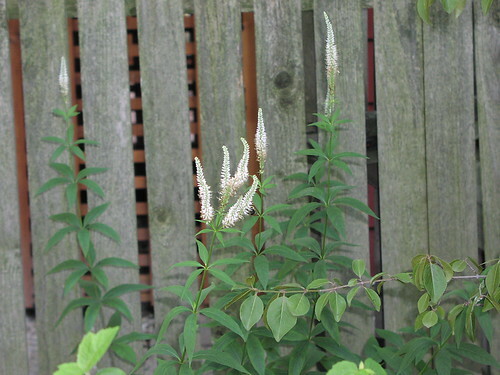 The plants are big and sprawly, and the one getting the most sun has had a lot of blossoms. I’m not sure whether we’ll actually get some tomatillos in the end, but as you can see above, we’re starting to get some fruit. The Melrose pepper is maybe 8 inches high, and it has a single pepper that is about 6 inches long and dragging on the dirt. Yes, it’s more than faintly ridiculous! The habanero, while bigger and healthier looking than the Melrose, has had blooms but no fruit. I’m sure that it’s the lack of sun in the bed that is at fault, but it’s not like I have a sunny bed anywhere in the garden. The bush cucumber has loads of blossoms and tiny 1 inch cucumbers on it – I may be zone 5, but I’m definitely behind Carol’s progress!